Have you ever wondered why so many people want to play guitar fast? Playing guitar fast is FUN (and very impressive to hear). ...the faster you can play, the easier it becomes to play at slower speeds without mistakes. Many people struggle to increase their guitar speed (even if they practice a lot), but some guitarists break through their speed plateaus very quickly. They use very effective guitar speed practice methods (I'll show you what they are in a moment). They use guitar speed tricks that make your fast playing sound cleaner and more accurate in just minutes (with little or no practice). You’ve probably heard people say things like: “start practicing slowly and gradually increase your speed in small increments”. This method works well for practicing a lick you’ve just learned, so you can play it up to your current top speed. This strategy doesn't help you to increase your top speed and break through speed plateaus you’ve been stuck at for a long time. Unfortunately, moving your fingers fast has very little to do with building your speed. When you focus too much on how fast your fingers are moving, you don’t focus enough on other important elements of your guitar speed. This turns your practice sessions into impatient attempts to play faster and leaves you really frustrated. There are 11 guitar playing elements to focus on that cause your speed to increase. 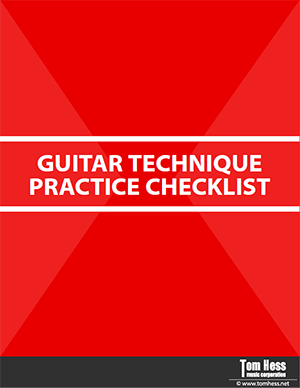 Download this free guitar practice checklist to learn what they are and why they help you play faster. (It’s free and you don’t need to enter your email address.) Print the checklist out and focus on these elements when you practice to build incredible speed. 2. No single guitar practice method will work for you 100% of the time. If you only use one guitar practice strategy all the time, building your speed becomes very hard. Different guitar practice methods help you master different elements of your guitar speed. All of your favorite guitar players have used multiple approaches to build their speed to the level it is today. The more practice methods you know, the easier it is to use the right one to overcome your specific guitar technique/speed challenges. Get Specific About The Problems That Hold You Back From Increasing Your Guitar Speed. Simply saying "I can't play guitar fast" is NOT specific enough. There are many different elements of guitar technique that make playing fast possible. Your guitar speed is limited by your level of mastery of each of these elements of guitar technique. This means: until you know exactly what elements of technique are holding you back, your speed will stay the same. Tip: Ask an expert guitar teacher to analyze your guitar playing and tell you exactly what is getting in the way of you playing as fast as you want. You can simply ask him/her to analyze your guitar playing and tell you the cause of your guitar speed challenges. Then all you have to do is practice and follow your teacher's advice to increase your speed. Use A Variety Of Practice Strategies For Increasing Your Guitar Speed. As your guitar playing skill level evolves, so will your specific guitar technique challenges. This means: the practice methods you use at each stage of your guitar playing also need to evolve. You might be wondering: Is there an ultimate guitar practice routine you can use to build your speed? Your guitar speed training routines should be tailored to your specific guitar technique & speed challenges. Download this free guitar speed eGuide to learn proven guitar practice strategies, so you can play guitar as fast as you’ve always wanted. Practice Integrating Your Guitar Techniques Together, So You Can Easily Play All The Challenging Guitar Licks From Your Favorite Guitar Solos. Over the years, I’ve taught hundreds of guitarists to become really good players. 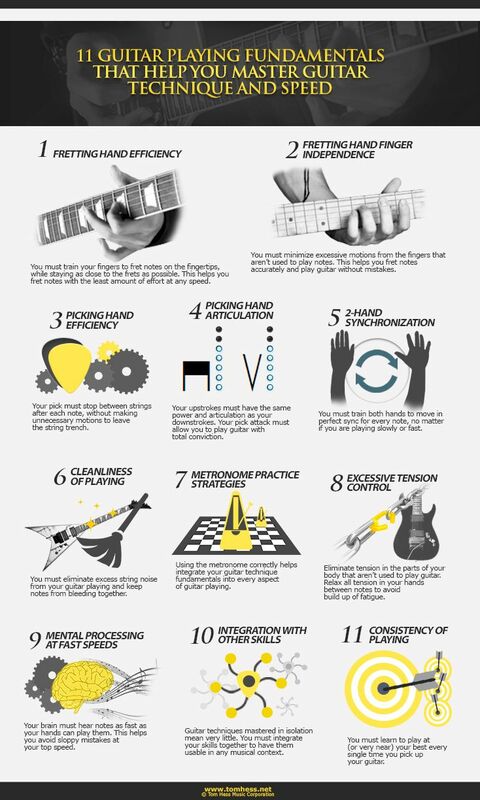 Most guitarists don’t spend enough time learning to integrate their skills together. Instead, they tend to only focus on one technique at a time. For example, you may practice sweep picking for 15 minutes, then move on to 15 minutes of legato, followed by 15 minutes of 2-hand tapping. This approach helps you improve these techniques in isolation, but doesn't help you combine them together. Bottom line is: you struggle to use the skills you have in real music. This causes you to make more mistakes when you play and feel less free to express yourself fully in music. Fortunately, integrating your guitar techniques is easy and fun (and it helps you create many cool licks). You now know the most common reasons why you might struggle to build your guitar speed. The next step is to learn how to practice to break through your speed plateaus and easily play all the hard, complex and fast guitar solos you want. Download this free eGuide to learn how to double your guitar speed and never struggle again to play guitar fast. To learn more about increasing your guitar speed, read the other articles in this series. Take your guitar playing speed to the next level fast with online lessons for guitar.